How many generations has your family been in egg farming? Our colony has been egg farming since 1978, and I am a second generation egg farmer. I was chosen to manage the layer barns on our farm in 2012, and was happy to carry on caring for the hens. It means providing a safe, healthy, affordable product for all Albertans to enjoy. I enjoy placing a new flock and watching them learn to use the aviary system. It's amazing how they move around on the perches and use the nests to lay their eggs in. Do you raise any other livestock and/or crops on your farm, in addition to your egg laying hens? Our colony also has dairy cows, beef cows, broiler chickens, and we grow wheat, barley, canola, peas and lentils. 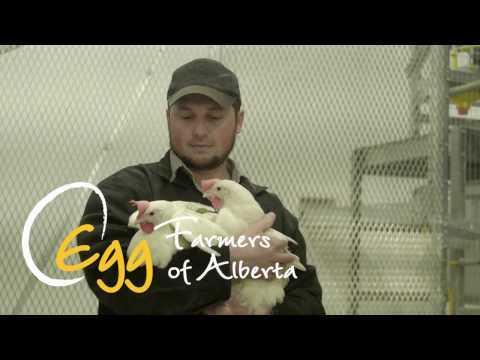 Being able to provide fresh, affordable, nutritious and delicious eggs for all Albertans to enjoy is very satisfying. I would like everyone to know that they can be certain that the eggs they buy at their local grocery store were produced by an egg farmer who takes outstanding care of his or her hens at all times, regardless of the type of hen housing system they were raised in.